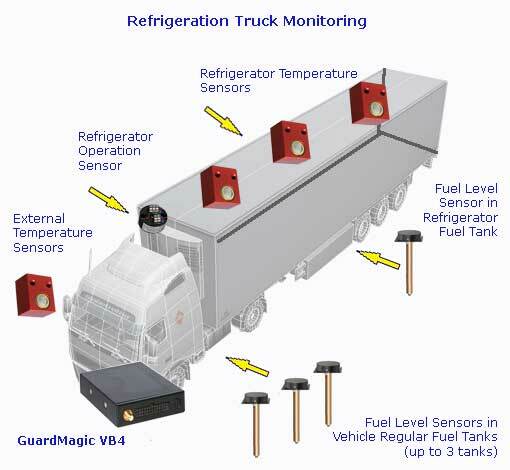 Vehicle and Fuel Monitoring. Road Fuel Tanker Monitoring. Fuel Level Sensor. Fuel Tank Monitoring. Vehicle Monitoring. Fuel Monitoring. Programming active stand by mode. Collect information from digital temperature sensors, fuel level sensors and send this information to monitoring station by GSM/GPRS network. Supports up to Seven digital temperature sensors. Make temperature measurement and send temperature data to main module (GuardMagic VB7). 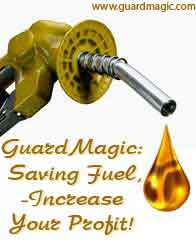 Make measurement of fuel level in fuel tank and send fuel level code to main module (GuardMagic VB7). Receive and store received information, analyzing received information, generate necessary reports and graph. - in stand alone PC (in customer office).